Although sculpture is not often taken into consideration by museums, alas, Houdon is an exception to the rule. The exhibition at the Musée Fabre in Montpellier is the third one highlighting the artist in the last few years. Versailles had organized a retrospective in 2004 (see article in French ; Atlanta, in turn – and this was one of the very few truly scholarly shows occurring under this partnership – was selected by the Louvre to present an exhibition based on its own collection , accompanied by a catalogue raisonné which was also published in French. The one currently taking place in Montpellier is not really a monograph but a blend of two special-study exhibitions. The idea first originated in Germany : the Frankfurt Museum wanted to organize a show around the different versions of Summer and Winter, also known as The Cold Woman. 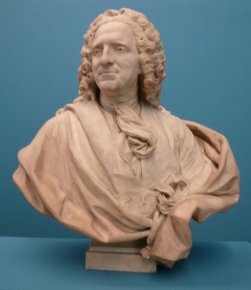 The curators turned to Montpellier for the request of a loan since it owns the marble for Winter as well as a small preparatory terracotta and the Musée Fabre then naturally decided to present the exhibition here. The first section therefore focuses on these two sculptures (reunited with The Cold Woman in bronze from The Metropolitan) and studies associated themes : The Seasons, but also the loss of innocence as symbolized by the broken pitcher at the feet of The Crying Woman. 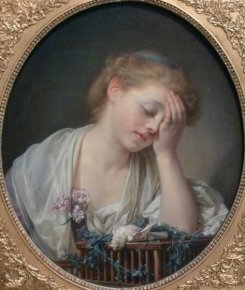 Greuze treated the same subject in a painting at the Louvre as well as in the very beautiful Young Girl Crying over her Dead Bird from Edinburgh (ill. 2) which, like the symbolism for the pitcher, represents the mourning of her virginity, a detail which did not escape Diderot’s attention. The Crying Woman by Clodion, lent by the Louvre, is in a very different spirit despite the identical title, since this is a funerary figure. Given the close friendship between the two artists, it is possible that Houdon remembered this work when he created his own mourner. 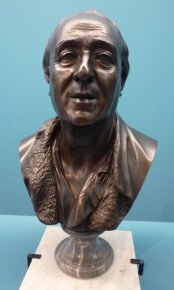 The most instructive and interesting section, however, is the second one, a veritable special-study exhibition on portraits. Houdon’s artistic production is compared to that of his contemporaries in a very enlightening manner, for example illustrating the differences in treatment and style with Jean-Baptiste II Lemoyne in their respective busts of Louis XV’s daughter, Madame Adélaïde (ill. 3 and 4). 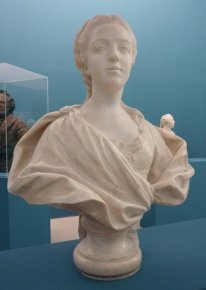 Whereas Houdon attempts to remain as realistic as possible, by sculpting the slightest detail in the lace or the hair with great virtuosity, Lemoyne (with an earlier work) evokes his model in a large mass, without decorative embellishments. 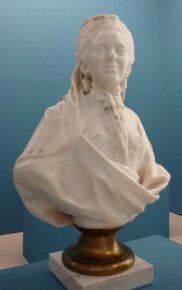 This juxtaposition allows us to better understand Houdon’s, but also Lemoyne’s, style – other busts by the latter (ill. 5) confirm this same tendency to sculpt in sweeping gestures, also by Pigalle (ill. 6) and Caffieri. In a very pedagogical manner, the characteristics of different techniques (marble, plaster, bronze, terracotta…) are described accordingly for visitors. The catalogue, with excellent illustrations, includes complete entries (whose purpose, let us remember, is not necessarily to restate already well-known facts in the case of famous works, but rather to place them in the context of the exhibition explaining their contribution to it and the reason for being there), as well as essays including, notably the one on supports in Houdon’s oeuvre. Visitor information : Musée Fabre, 39 boulevard Bonne Nouvelle, 34000 Montpellier. Tel : +33(0)4 67 14 83 00. Open on Tuesday, Thursday, Friday and Sunday from 10 to 18, on Wednesday from 13 to 21 and Saturday from 11 to 18. Rates : 8 € (full price), 6 € (reduced rate).